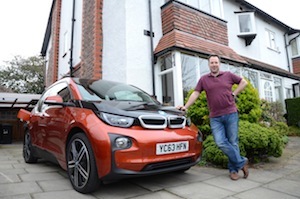 We’ve experienced the BMW i3 at its launch, but what’s it like to live with? 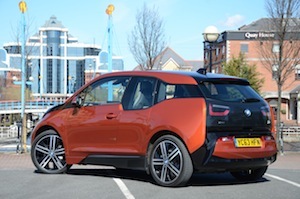 And how did our guest road tester cope with driving the i3 from Manchester to London? Virtually all manufacturers are now looking at offering vehicles with some form of plug-in capability, in order to meet strict emissions targets. A range of approaches are now evident, including regular models with a petrol or diesel engine swapped for an all-electric powertrain. BMW however has gone for the start-from-scratch strategy, creating an all-new car from carbon fibre-reinforced plastic (CFRP). Building a car from CFRP makes it much lighter than if it was built from steel. Dropping an electric powertrain into the car adds extra weight, but overall the i3 is still lighter than most cars in the family hatchback class. 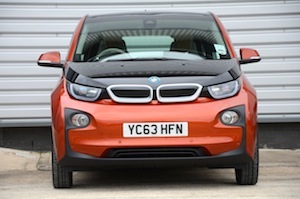 The i3 is available as an all-electric car or as a range-extender. The all-electric version has a range of 80-100 miles, whereas the range-extender has a slightly reduced electric range of 75-93 miles, plus an additional range of 75-93 miles from the petrol ‘generator’. More of this later. The i3 is recognisable as a BMW thanks to its grille, but if you took the grille away, many people would struggle to identify the i3 as a BMW. This is because it’s a start-from-scratch design. The main powertrain component, the lithium-ion battery, sits under the floor of the vehicle. This means the passenger compartment doesn’t have to be constrained due to an engine and gearbox. 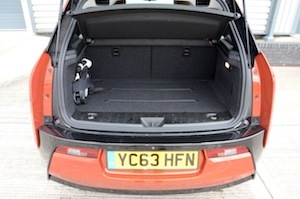 Even the range-extender – a 650cc, two-cylinder 35hp petrol BMW motorcycle engine – sits under the floor of the boot. This acts as a generator to charge the battery when it’s depleted, and results in a weight increase of just 150kg over the pure EV version. 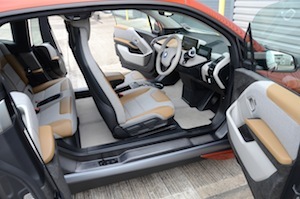 All this means that the interior of the i3 is open and airy. It’s very modern – but also has a touch of retro to it. It’s designed to give the feel of a lounge, and it certainly does give the impression of a lounge more than, for example, a 3 Series. This unique feel is helped by the ‘coach doors’ – the rear doors open backwards, and there’s no central door pillar. This results in access which looks very open, although the rear doors are narrow, and head room is quite limited on entry. Also, the inner handles that you pull to open the rear doors feel quite fragile. The BMW i3 has all the qualities of other electric vehicles – it’s quiet, refined and has good acceleration – but it also has rear-wheel drive, mated to the low centre of gravity. This makes it the default choice for keener drivers who may not have considered that an electric car might be for them. 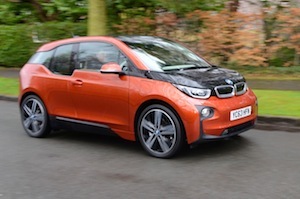 One feature of the i3 that is very different to conventional cars is the regenerative braking. All electric cars have this technology, but it’s much more pronounced in the i3 – to the extent that you very rarely have to use the foot brake; take your foot off the accelerator and the car will brake itself. BMW claims that the ability to drive the i3 with just one foot is a strong selling point when driving in urban traffic. However some people may not like the sensation of the car constantly braking when lifting off the accelerator. After driving the i3 for a while you get used to having to lift off the accelerator slowly rather than quickly, and this reduces the acceleration/deceleration sensation. We’d personally prefer to see an option to adjust the amount of regenerative braking; dialling down the level of intensity would reduce the efficiency, but would make for smoother progress. A hill holder function would also be useful. 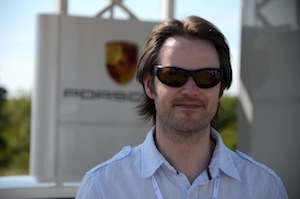 The only issue was getting used to the braking which meant my driving was a bit jerky. When you take your foot off the accelerator the car uses the decrease in speed to charge the battery. A great idea but the resistance produced by this doesn’t make for smooth deceleration. No worries on the battery charge. Obviously this journey is what the car is designed for. I put the car on charge overnight ready for the main test the next day. On a full charge I embarked on the more ambitious second journey: a trip from Altrincham to Watford, then onto Bracknell. I was a bit nervous at first about the distance and the estimated range of the car. Also, the estimate on the dashboard had a habit of changing by 5 to 10 miles without much warning. I just had to keep reassuring myself that there was also the fallback of the petrol tank, which would always buy me an extra 50/60 miles. As I started down the M6 I was conscious of the size of the car in relation to other larger motorway traffic so I decided to play it safe and stick between 60-70 mph, not least to make the battery last longer. One great thing was the inbuilt satnav. It highlighted a major crash on the M6 which would have added hours to my journey had I not followed the instruction to go off-piste (via the A50 through Stoke-on-Trent) to join up with the M1 near Donington Services. That was a good start. Before setting off I’d done some research on where the charge points were along the M6 and M1, and I planned to try this out half way with Watford Gap being my best bet. Now my route had changed I remembered there was one of the quick charge points (30 minute supercharge) at Donington Services. So I decided to keep driving once the battery life ceased somewhere around the Welcome Break near Derby. That was almost 70 odd miles on the one full charge. The performance didn’t really change much once the petrol kicked in, but there was a slight hum coming from the boot. That was a little strange as you get used to the silent swish of driving electric. The dashboard said I had 50 miles left with almost a full petrol tank. Once I’d travelled 10 miles I reached Donington Services. I found the charge point which was tucked away in the corner of the car park. It was an Ecotricity charge point which stated I needed a special card to use it. I rang the help number on the side of the charge station as I had no card, no membership of Ecotricity, and, most importantly, no charge left on the car. They told me there was no way to get a charge here unless I joined up, applied for a card and waited about a week for it to be delivered. Not what I wanted to hear given I only had 40 miles of fuel left and it was 10 o’clock at night. So I hopped back in and set off for my initial charge point plan at Watford Gap. I was a little nervous by now as that was 30 miles away and I had only 50 miles in the tank. I should have just filled up in Donington to limit the stress. But by this point as I was on a mission to get the best from the car in terms of fuel efficiency and time of journey! I reached Watford Gap with 10 miles of petrol to spare (or so the dashboard read-out told me – every now and again it recalibrated to give me more, then take it away again to crank up the tension). I could, however, have wasted that 10 miles of petrol looking for the charge point. I eventually went to ask a lady in the petrol station where the charge point was. She shrugged and asked her colleague. They’d never heard of it. Was this a conspiracy by the oil companies? Do they tell their staff never to help electric car drivers? I wish that was the case, but unfortunately not. No-one had heard of the charge point. It was late. I was tired. So I just filled the petrol tank up and headed off. This seems to be the main problem with owning an electric car. There seems to be no coordinated country-wide approach to charge points. They seem to be installed in an ad-hoc fashion, with differing connections, levels of electricity available, and limitations on who can use them. Of course there’s also the issue of the time required to recharge the car compared to a two minute petrol refuel. Having different companies, with differing connections, makes it very complicated to plan a journey. And the average UK driver does not do complicated! Compare this to the ‘freedom’ that comes with petrol stations being almost everywhere, then you can see why it’s going to be an uphill battle to get petrol car users to switch. It’s all in the mind, I know, but the perception of there being limited car charging points, that are so complicated to work out how to use, means it’s a reality. BMW claims that it has reached an agreement with charge point companies to have one card that works with the majority of UK charge points. If so, perhaps BMW should provide such a card with electric press cars! I completed the rest of my journey on petrol. To add insult to injury, I had planned to use a public charge point in a public car park just around the corner from where I was staying. However, this one required the use of a council card (whatever that is) and even required me to pay for parking! I sacked that off and persuaded the person I was staying with to allow me to charge at their house, much to their upset, as they saw the meter whirr away once the car was plugged in. I do understand that BMW recommends installing your own purpose-built charge point, not a 13 amp feed via an extension cable! All in all, I was impressed with the car given it was my first real experience of an electric car (with a petrol back-up). This is surely the future of driving as it does take away the range anxiety stress of pure electric cars. I know they’re not designed for long motorway journeys, but it’s good to know you can do it in an emergency, albeit with a few stops for fuel. The pure electric version of the i3 has zero tailpipe emissions. The range extender version has official emissions of 13g/km CO2 and economy of 470mpg. These figures are obviously a result of the flawed NEDC test. In fact, rather than quoting the car’s official NEDC driving range, BMW is instead providing figures for its real-life range, which is 80-100 miles. The range-extender version has a two gallon (nine litre) fuel tank, which only gives you an extra 75-93 miles of petrol range. This means that if you drive an i3 in petrol mode you won’t be getting 470mpg, but instead a rather underwhelming 40 or so mpg, which is over 160g/km CO2. The slight weight gain also means that the real world electric range is reduced from 81-100 miles for the pure electric model to 75-93 miles. All this may sound surprising, but the range-extender is intended as a very lightweight solution to provide extra range for occasional rather than regular use. BMW expects the range-extender version to be the most popular model to start with, but predicts that the EV will become the better seller over time. 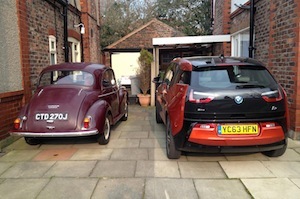 Note that the pure EV version of the i3 is lighter, faster and more efficient. 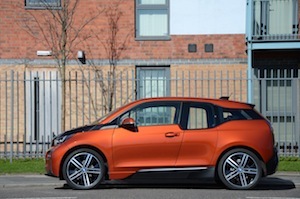 The i3 has a charging time of three hours to take it from a zero to an 80% charge, using the 32 amp AC fast charger that BMW recommends to charge the car – or four hours from completely empty to full. Using a standard three-pin plug – seen as an option for occasional use only – the charge time increases to eight hours. It’s also possible to recharge from DC rapid chargers if you specify this optional ability with the car. A DC charger up to 50kW will provide a full charge in just 30-60 minutes. There is a growing network of public rapid chargers around the UK. It should cost less than £2 to fully charge the i3. Based on driving 8,000 miles per year, and recharging with a standard electricity tariff, it should cost £21 per month to charge, or just £9 if an Economy 7 tariff is used. This compares to £87 per month for a diesel car that averages 50mpg, so the savings in running costs for the i3 are significant. For business users, the all-electric i3 has a zero benefit in kind rate, and just 5% for the range extender. 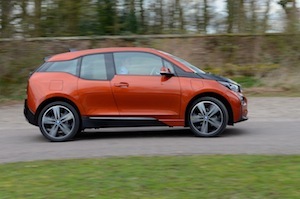 The basic price of the pure electric i3 is £25,680, or £28,830 for the range extender (a premium of £3,150). These prices are after the government’s plug-in car grant of £5,000 has been deducted. 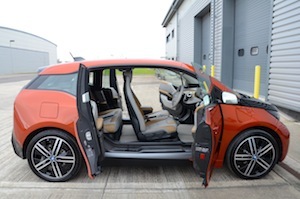 The i3 has three trim levels – Loft (£1,000 more than the standard interior), Lodge (£1,500 extra), and Suite (£2,000 extra). 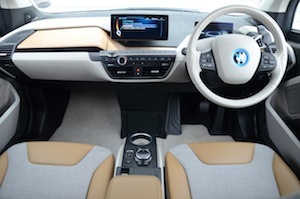 Standard equipment for the i3 is based on the benchmark of the BMW 3 Series SE, which includes features such as business navigation and Bluetooth. As with all BMWs, but unlike most other electric cars, you can specify a huge range of options. 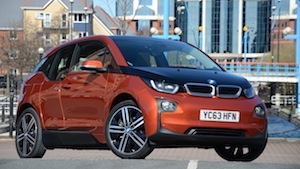 You can lease an i3 for £369 per month. This is based on a £3,000 deposit and 36 monthly payments of £369, with a maximum of 8,000 miles per year. BMW’s home charging wall boxes are available at a cost of £315, after a government subsidy. 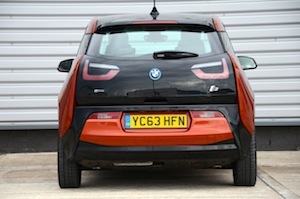 BMW also has an energy partner that will provide a 100% renewable tariff to ensure that the i3 really is zero emission. With 0% benefit in kind for the pure electric version, and just 5% for the range extender, the i3 has very low running costs from a company car tax point of view. It’s also exempt from the London congestion charge. The i3 comes with an eight year or 100,000 mile battery warranty. The BMW i3 is a rear-wheel drive electric car with a very low centre of gravity. It’s also very light weight because it’s constructed out of carbon fibre. Within a few minutes of driving the i3 it’s obvious that it’s been designed to incorporate the feel of the traditional BMW driving experience, which sets it apart from most other electric cars. It’s also very cool. However it shares the qualities of other EVs – quiet, smooth, refined, with lots of torque, and great acceleration for urban driving; a very pleasant way to travel. If you occasionally need more range than the 80-100 miles of the all-electric version, then you can specify an i3 with a range-extender. After a week with the car, and driving it to its range limit and beyond, we would say that the range-extender is definitely a worthwhile insurance policy. You can drive anywhere, knowing that you have an emergency back-up if required. The relatively harsh regenerative braking is certainly a different experience than in conventional cars, and the gear selector on the right hand side of the steering column takes a bit of readjustment. Even with the £5,000 government plug-in car grant, the i3 is expensive, and it can easily become more pricey when options are specified. Overall, the BMW i3 is a welcome addition to the electric car market. It provides a product for drivers who want a more premium feel than is on offer elsewhere, and it also takes the driving experience to the next level.